Acacia pycnantha, or golden wattle, is a small tree native to southeastern Australia, and is, in fact, its national floral emblem. It is widely naturalized throughout the Mediterranean basin. It is sensitive to cold, but in milder winters, can bloom with spectacular effect. Lenten Rose, helleborus orientalis, is a late winter flowering, clump-forming perennial native to the Levant (orient). It is so named because it blooms during Lent, and its color is Passion purple. Muscari armeniacum, or grape hyacinths, are bulbous perennials native to Eurasia (like Armenia!). They are among the first flowers to bloom in Spring. Given the right conditions, they love to multiply and naturalize. Each of these clumps of flowers here at Gratus originated from a single small bulb, smaller than the size of your fingernail. Pyrus calleryana, or Bradford Pear, is a deciduous, hardwood, ornamental tree native to China and Vietnam. It is widely planted for its showy white spring blossoms and reliable orange-red fall foliage. It produces small hard inedible fruits, loved by birds, who happily disperse their seeds, making the tree invasive in many parts of the country. One of the first to bloom here at Gratus. Hyacinthus orientalis, or common or Dutch hyacinth, is a widely planted bulbous plant native to southwestern Asia. The flower stem is called a raceme and produces up to 50 highly fragrant and beautifully colored flowers. Jonquils are the first bulbs to bloom here at Gratus, as early as late January. They are bulbous, flowering perennials native to southwestern Europe. They naturalize nicely here in our climate, this clump arising from a single bulb! The first ornamental to bloom each year at Gratus. The double flowering purple plum is a cross between Prunus mule, or Japanese apricot, and the cherry plum, Prunus cerasifera, from southwestern Europe. Acer rubrum, or red maple , a common deciduous tree of Eastern and Central North America, is widely planted as an ornamental for its spectacular fall foliage. Acer x freemanii is a hybrid of two common native deciduous trees of Eastern and Central North America: the Red Maple, acer rubrum, and the Silver Maple, acer saccharinum. This common selection provides the adaptability and rapid growth of the silver maple with the superior fall color of the red maple. One of the first trees to turn here at Gratus, and a favorite. Cornus kousa, or Chinese Dogwood, is a small, deciduous flowering tree native to East Asia. It typically flowers later, up to one month, than our native dogwood, Cornus florida. Pictured here are the sweet edible fruits, looking so luscious in the early autumn. The driveway into Gratus, lined with Cupressus sempervirens “glauca” or Italian Cypress native to the Mediterranean, and Populus nigra “Italica” or Lombardy popular native to the Po River region of northern Italy. Nice combination. Note that it hangs down from its branch-this is important as we examine other types of cones. Chamaecyparis lawsoniana, "Golden Showers". A stunning golden weeping form of Port Orford Cedar or Lawson's Cypress. It is actually not a cedar or cypress, and native to the Pacific Northwest. One of my favorites. Helianthus, or common sunflower. Native to North America, this beloved flower represents loyalty and longevity, projecting the energy of the sun itself. Symphotrichum oblongifolium. Fall or Aromatic Aster. Hardy American perennial that blooms late summer into fall in shades of blue, lavender, and pink. Table grapes are ready at Gratus Vineyards! Table grapes are cultivars of the wine grape, Vitis vinifera. They are big, juicy, sweet and many are seedless. They come in white, red, and blue-black varieties. This cluster is Flame Seedless, and ready to pick and eat immediately. In the U.S. , California is the biggest producer, of course! Veraison at Gratus Vineyards. Change in the color of berries indicates the onset of fruit ripening. The countdown to harvest is on! Digiplexis, an intergeneric hybrid between digitalis purpurea and isoplexis canariensis, is a tender perennial that unlike it foxglove parent, provides continuous flowering throughout the summer, as well as being more drought and sun tolerant! 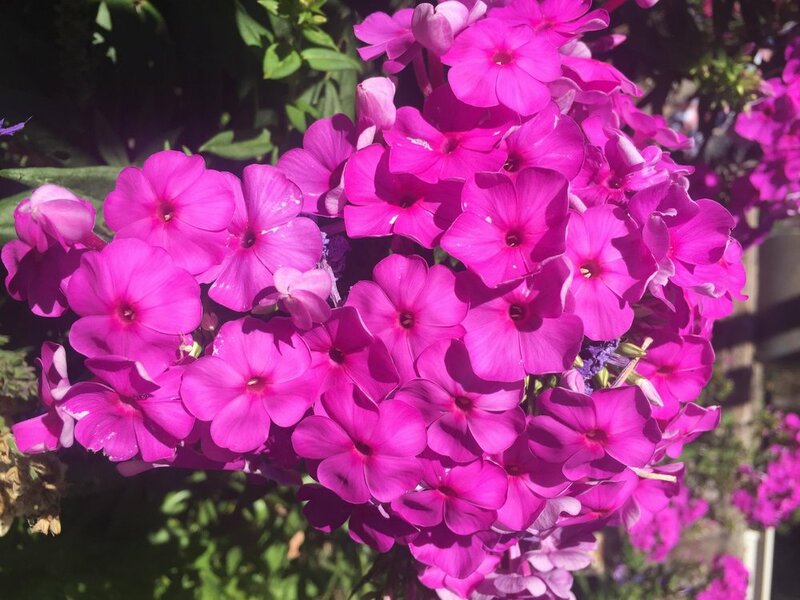 Phlox paniculata. A perennial flowering plant from the eastern US, a beauty I fondly remember from childhood in Pennsylvania. It blooms in vibrant colors all summer into autumn. Vitex agnus-castus. A flowering tree from the Mediterranean, known to both the Romans and Greeks. 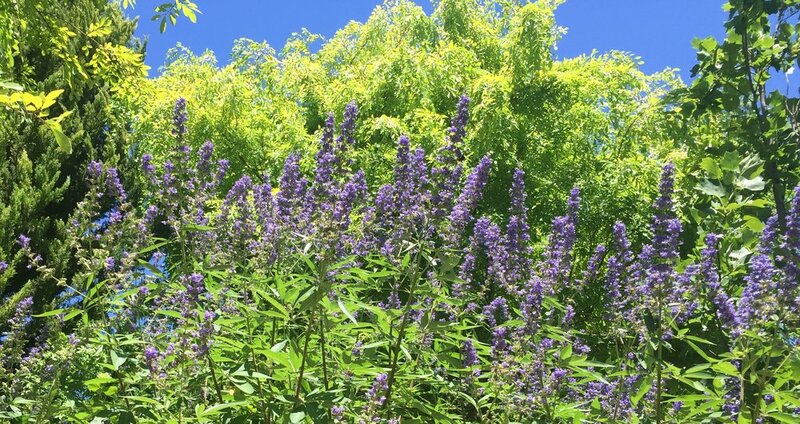 Vitex in Latin means “weave” and agnux and castus mean “chaste” in Greek and Latin. Thus, it gets its name, the Chaste tree, for its purported aphrodisiac powers.